Imagine having a quick and fast way to get up to speed with social media or to get your work done in less time (and with more confidence). When I’m in a pinch or into something new, one of the first places I turn is toward a template. 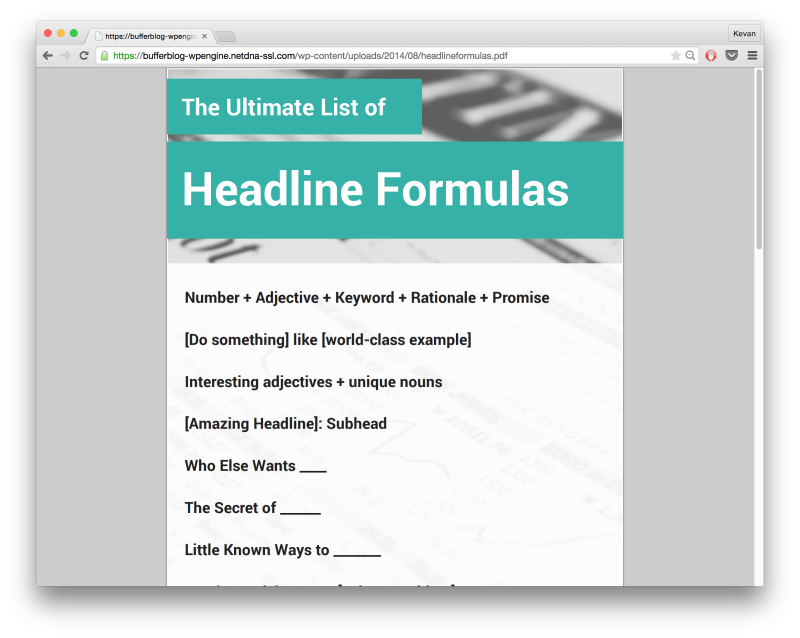 I’ve built a stash of headline formulas, social media updates, and more to help organize my mind when it comes to working fast and learning something new. 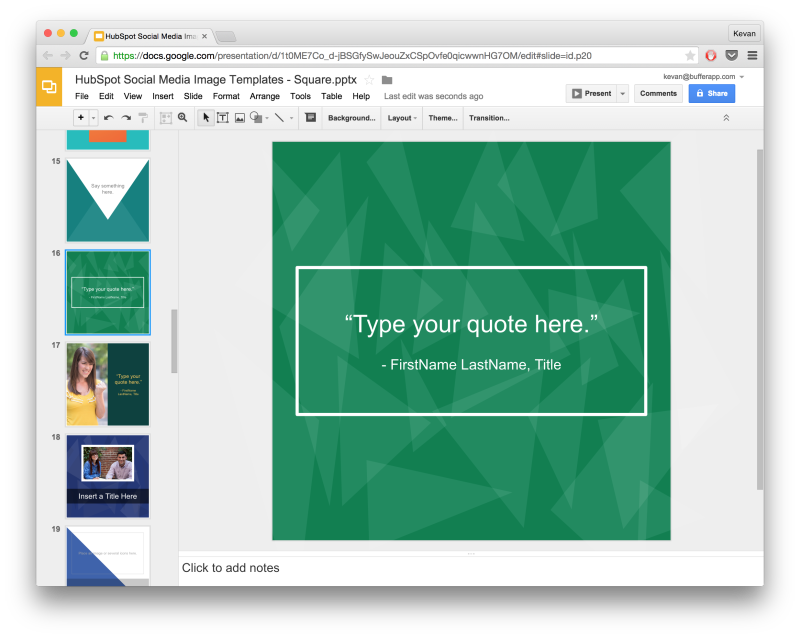 Templates can be a lifesaver and a time-saver. 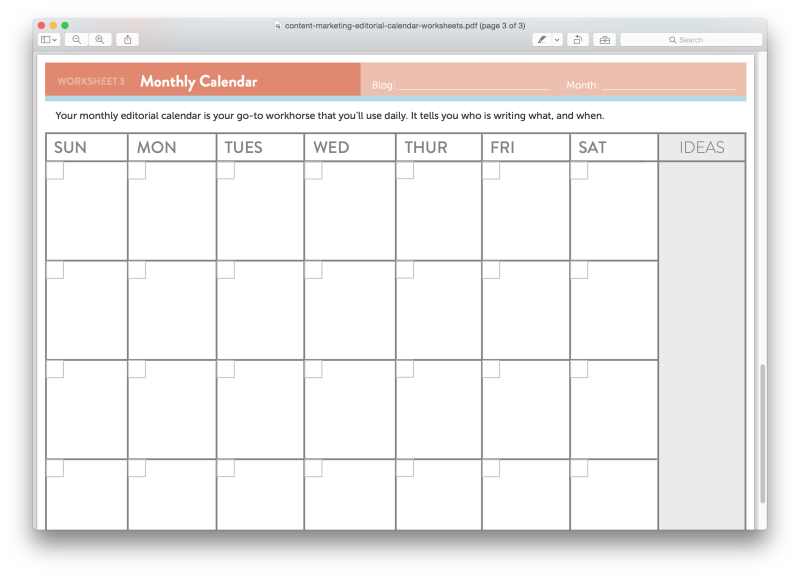 I have my favorite go-to templates, and I was also able to dig up a huge number of others, created by some really amazing folks who are generous to help us all work smarter. I’ve collected them here below. I’d love to know which ones might be useful to you! The list below is full of a variety of different templates, some helpful in a high-level way of organizing your marketing efforts and others in a specific area of social media marketing and sharing. If you have a favorite template that didn’t appear on the list here, let me know in the comments! 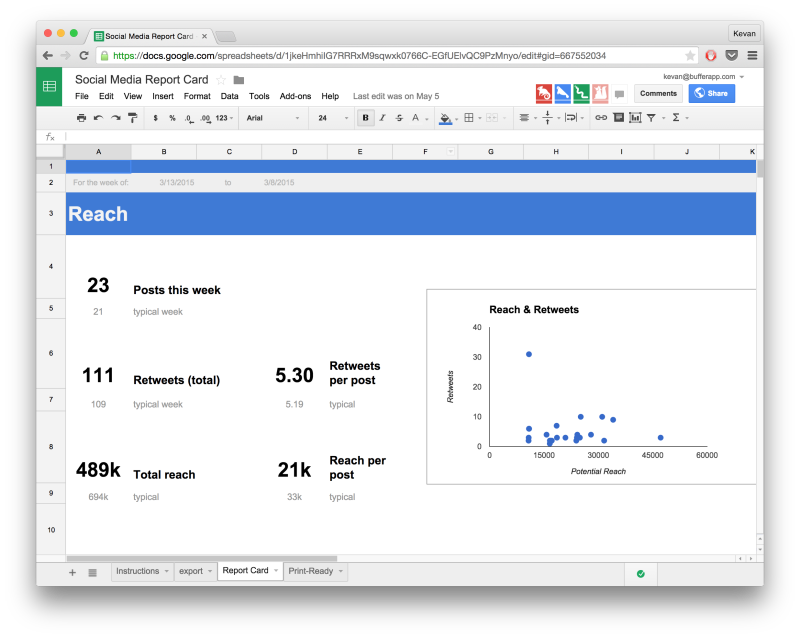 We built this social media report to be easy to fill with just a simple Buffer data export. 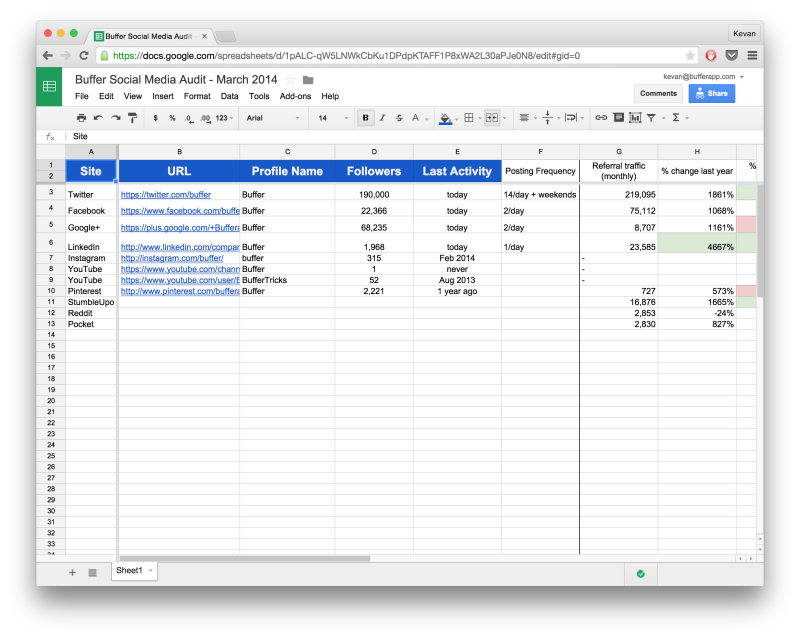 Take your Buffer stats and import them here, and you can see stats for the past week as well as how they compare week-over-week and to your monthly benchmark. The spreadsheet does the rest! 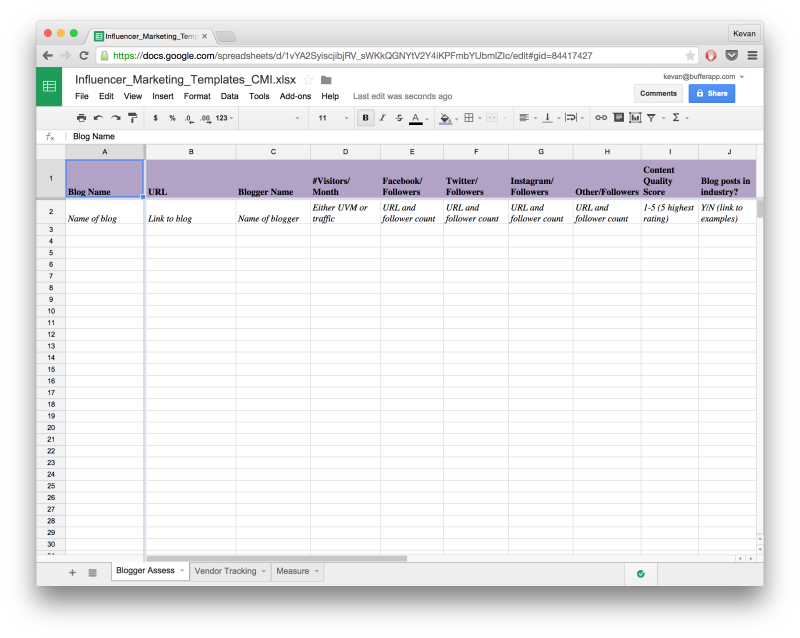 We’ve used this template on a monthly basis to check in with our social media accounts and see how things are growing, changing, and (hopefully!) improving. It’s also good to run through the list here to stay on top of any new networks or pages that might need a visual update to stay consistent with your branding. A copywriting template might seem a bit far afield from social media, but where we find the most social media value from these templates is in composing a short update or thinking through the value and message behind what we’re sharing. The copywriting formulas are all here in this blog post. 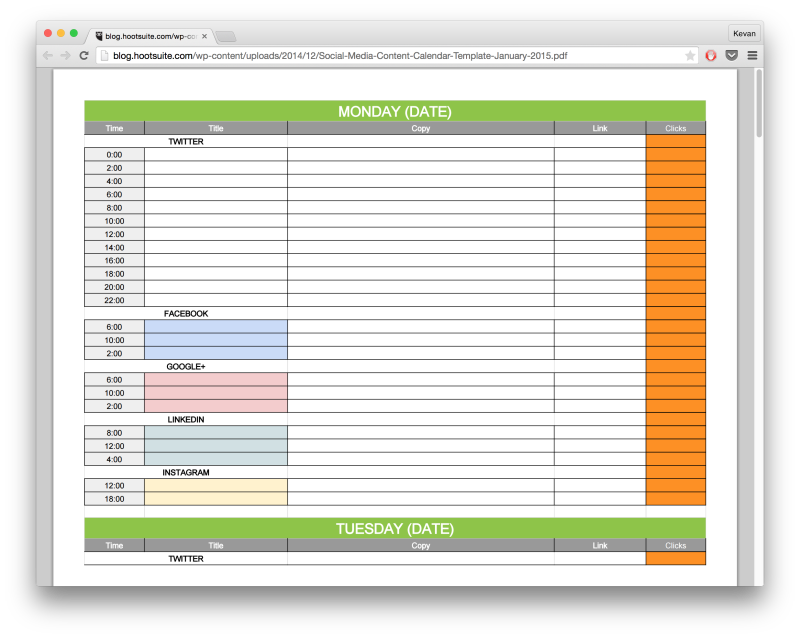 All these templates are available in a spreadsheet where you can quickly test out and reference the different styles. 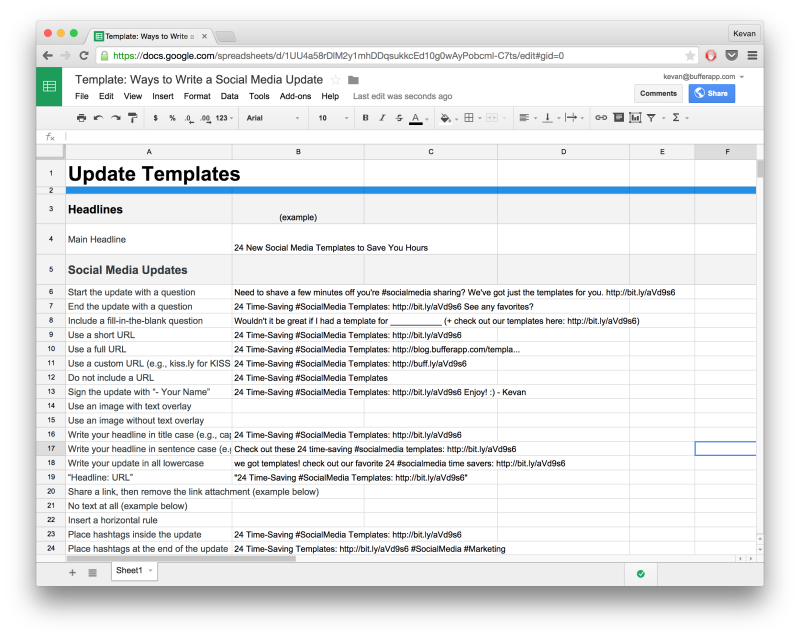 Visuals are a key component of the social media updates we post at Buffer, and one of the best resources for developing a system of visual sharing is the templates provided by HubSpot. The free download gives you 30 rectangular and 30 square templates, plus an assortment of warm, cool, and neutral color combinations. With influencer tracking, you can keep on file all those who have reached out to you or linked to you or otherwise made an impact on your social media profiles. You can turn the list into potential/future outreach options as well. 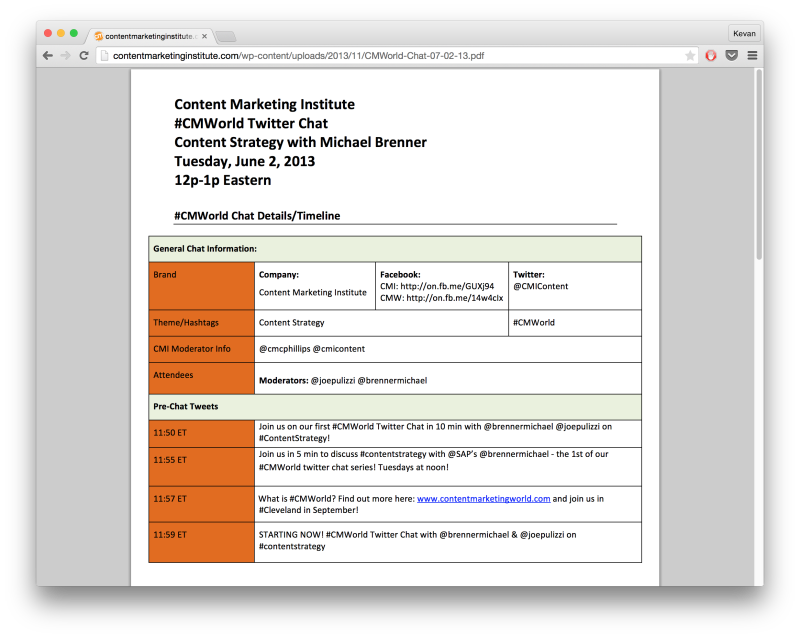 The great part of this template from Content Marketing Institute is that it includes social media follower numbers as well so you can easily combine your website and social strategies together. Along with organizing the way that you’ll promote each of your articles, it can be helpful to see how your content and social media marketing fit together from a bird’s eye view. Which campaigns are coming up? Which holidays? Which major events? What product launches or feature releases are on the horizon? Things like this can be great to add into an editorial calendar so that all your many events and activities can mesh with your social media marketing. Plug in your business’s unique info, and away you go! Adding your content to this template from Hootsuite will help you stay on top of the performance of your social shares, making sure that you’re focusing on the best-performing posts and maintaining a steady stream of content across all your accounts. Place the title or category of your update in the first column. Add the update text to the second column. Add the URL to the third column. 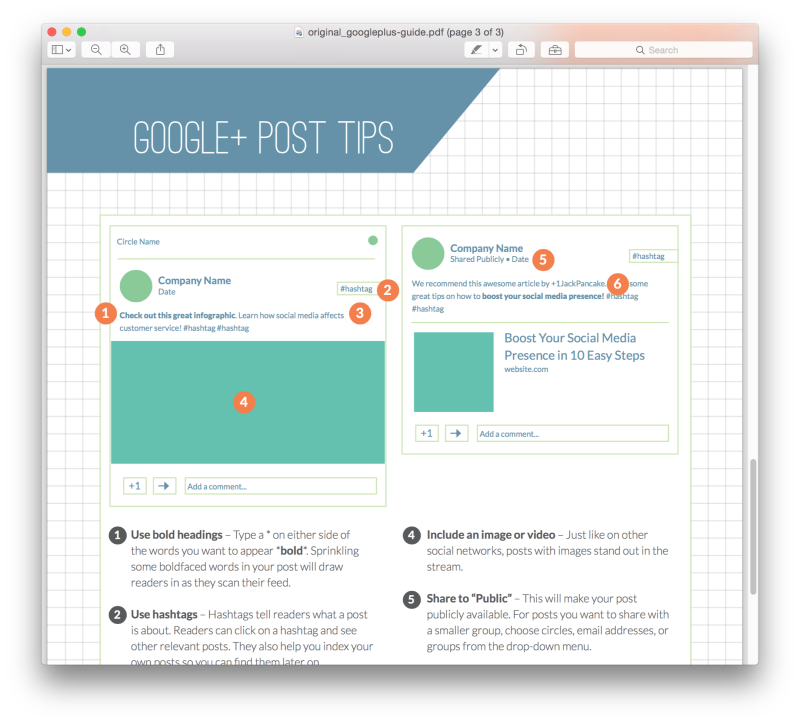 There are many great social media image size templates out there. The one I keep coming back to is this resource from Sprout Social, which lists the ideal image sizes for Facebook, Twitter, Instagram, LinkedIn, Google+, Pinterest, YouTube, and Tumblr. Sprout Social keeps the list always up to date, and you can find the ideal image sizes either via the blog post or via a free Google Doc. For specific advice on each network—including a simple tutorial on identifying the different pieces and parts of the social network—the templates from Short Stack provide a lot of great value. 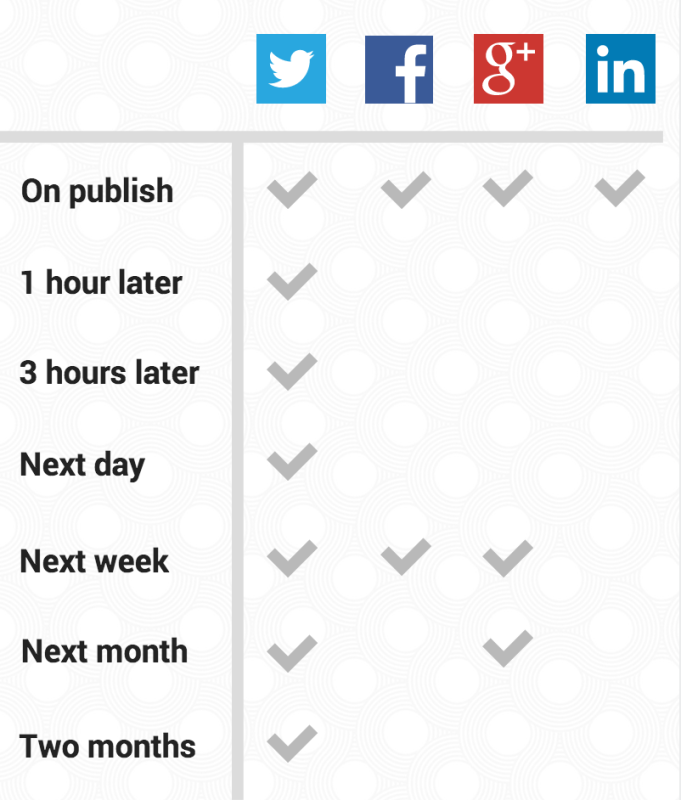 Each one is available as a separate download so you can pick and choose the ones that are relevant to your strategy. 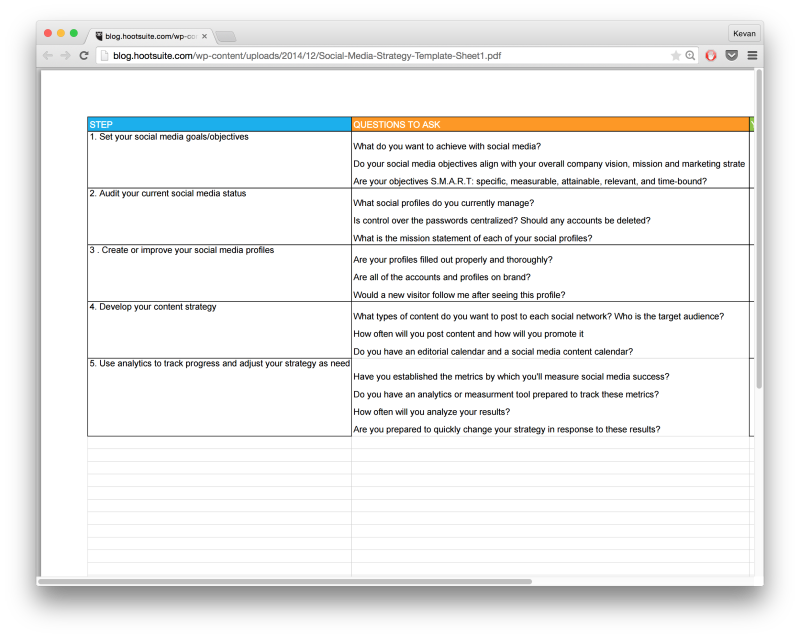 This helpful template from James Prideaux allows you to track the conversations and engagement happening around your business or keywords. Instructions: Add the following information to the spreadsheet. This template from Cathy McPhillips is great for those interested in starting up a Twitter chat. We’ve found that many of the fill-in-the-blank options here are similar to what we do for our weekly #bufferchat. 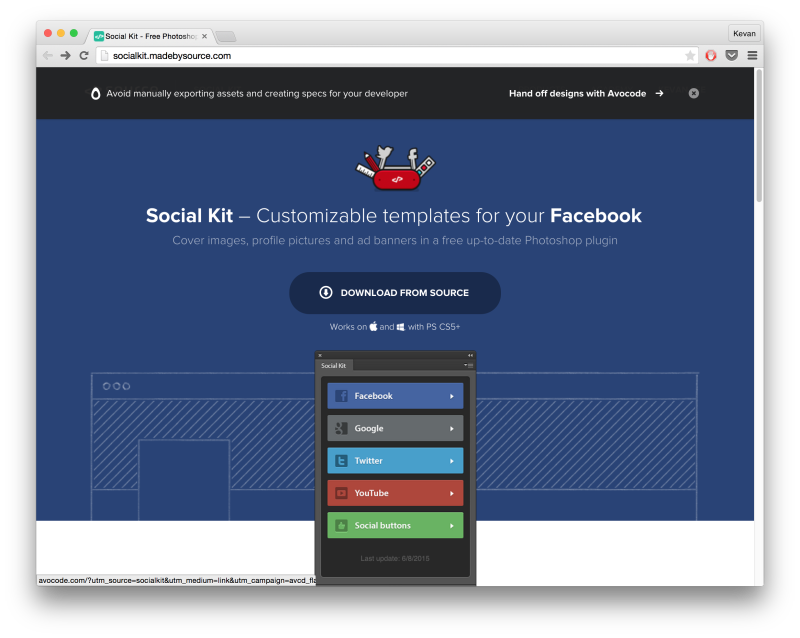 Social Kit—a free resource from Source—contains templates for Facebook, Twitter, Google, and YouTube, as well as custom social buttons. If you’re savvy with Photoshop, you can download the Social Kit plugin for free and have an easy way to build ideal social images for your business.